In the course of urban sketching or life drawing, I am often approached by the curious who are fascinated by my choice of medium. I've found that the combination of iPad Air + Procreate + Intuos Creative Stylus = creative awesomeness! Why yes it is. I use an iPad Air and love it for many reasons. After getting used to the feel of the rubbery stylus nib gliding over glass, the lines between mediums disappear. My app of choice is Procreate. I have tried many art apps for the iPad including Sketchbook Pro, Sketch Club, Art Rage, Inspire Pro and Brushes. They all have their pluses and minuses, but Procreate is the only app that, to me at least, makes drawing and sketching natural and efficient. I used to use Ten One Design’s Pogo Connect with my iPad 3, but it does not work with the iPad Air due to hardware differences that can’t seem to be fixed. I got the Creative Stylus shortly after I found that the Pogo Connect would only make chicken scratches with my iPad Air. The Creative Stylus is an amazing tool! The only thing I’m not so happy about is that the rubber nibs wear out very quickly. (Are you listening, Wacom?) But pencils need to be sharpened, and pens, paint and paper get used up… I chalk up the occasional purchase of nibs to materials I need to replace every now and then. The Intuos Creative Stylus comes in a great solid case, complete with space for spare nibs (you get 2 extras with purchase) and a slot for a AAAA spare battery. Do you use your finger? I could use my finger, and do in a pinch, but choose not to because it’s harder to see what I’m doing. I’m a huge Apple fan but disagree with Steve Jobs on this point - the iPad does need a stylus; at least for drawing and painting. But that’s just me. I am well aware that there are many iPad-based artists who are happily using their own digits. Can you draw on paper? The iPad has been around for about 4 years. I’ve been drawing for a little over 40. I did learn to draw on paper (although my parents might interject that some walls and furniture should be included too). What made you decide to use an iPad? I made the switch for several reasons. The short answer is ‘convenience’, but there’s a lot more to it than that. ...not forgetting all the other usual reasons people use an iPad; it's like those magic hats with no bottoms from which I can pull out my library of notes, books and magazines, my music collection etc. The other fact some people fail to consider is, using an iPad has turned out to be much more environmentally friendly than I first thought. I hardly consume any paper / paint / ink / pens now. Have you ever thought about the resources required to produce all the paint, ink, pens etc? And not much of that is recyclable. And some of it is toxic too (think packaging, paints with heavy metals like cadmiums, and their accompanying fumes). Good questions. The truth is, I keep all my gadgets and fix them if they don’t work. Or pass on stuff I don’t use. My Mom is using my first iPad. If she didn’t need it, I’d use it in other parts of my home; as a recipe holder in the kitchen, a magazine reader by my bed (ooh - more paper saved!) And in a couple more decades, I thought it would be interesting to create an art installation with all these gadgets that have contributed to my creative output. Please note that I don’t claim to have all the facts and figures to support my hypothesis that using an iPad could be greener than traditional media. You have to admit that it’s worth contemplating though, and if you know of a reputable study that makes such a comparison, I’d love to hear about it. Would you go back to using paper? To that, I’d say, "Never say ‘never’ ". I absolutely love what the iPad + Procreate + Intuos Creative Stylus allow me to do now, but if there’s something I want to do that is not achievable on an iPad, sure. Paper, canvas, board or concrete… bring it on! What’s that handle-thingy you use on your iPad? What you see is a device called the Bracketron Twist 360. It's not an iPad case. It's more of a tablet holder that can set your iPad in any orientation you can think of. I’ve tested many kinds of iPad cases, and whenever I upgrade my device, get a little irritated at the wasted covers and cases I can no longer use because of a few millimeters difference in size. I wanted to find something durable and extremely versatile to use with my current iPad, whether or not it grew or shrank by an inch or so. I also wanted a way to prop my tablet up in any orientation I choose. All this and more I found in the Twist 360. I hope this has given you some insight! I welcome questions and will add relevant ones and my replies to this list as they come up. Every year, about a week before the lunar calendar says it's time for Chinese New Year, Victoria Park in Causeway Bay, Hong Kong, undergoes a transformation. Within a few short days, bamboo frames and flapping tarpaulin walls become a colorful tent city filled with blossoms and fragrance. Bustling, booming and blooming! 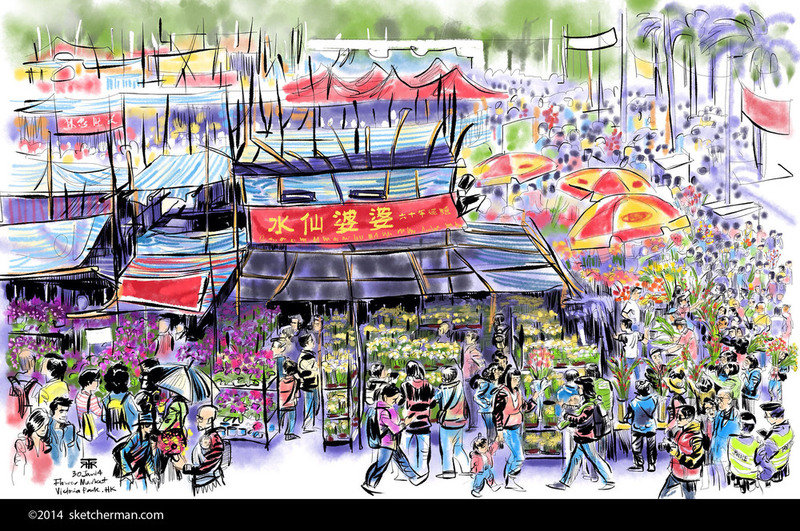 The annual Lunar New Year Flower Market is one of the best places to get a feel for Chinese New Year festivities. 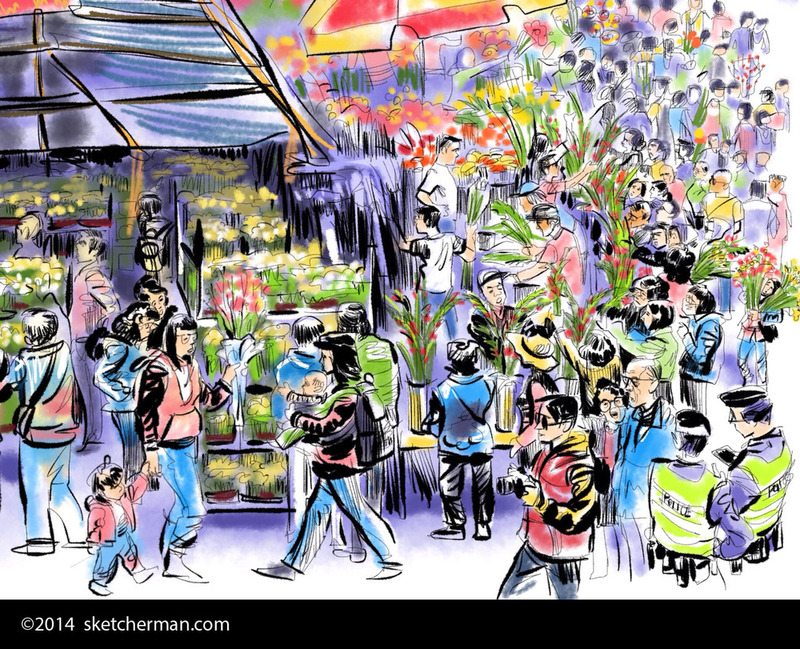 On opening day of the Flower Market, the crowd pours in. Jubilant anticipation of festive cheer translates into ringing cash registers as people purchase flowers of all kinds, bearing all manner of auspicious names, to brighten up their homes. Apart from flower vendors bursting with bloom, locals and tourists alike also push past seasoned vendors, as well as young entrepreneurs from schools and colleges, out to make some seasonal income from the happy crowd. Stuffed toys of all kinds and gimmicky gadgets jostle with gaudy golden spinning wheels that promise to turn one's fortune around. Pounding drums, enthusiastic screaming vendors, squealing children and the chatter of thousands of excited voices all contribute to the buzzing atmosphere. Here's a close-up so you see some of the details more clearly. With each passing day, the crowd grows in size and volume, reaching fever pitch on the final day, New Year's eve, when happy revellers shuffle along together, ever on the lookout for heavily discounted merchandise. Competing vendors can be heard shouting the latest bargains well into the crack of dawn, when it's time for all to pack up and catch a few hours of sleep before it's time to awake and begin several days of festivities. If you didn't catch it this time, mark your calendar for next year and join the fun!